Stuffed with red, yellow and green peppers with sauteed broccoli, black beans topped with BBQ sausage and chic'kun (vegan meat) drizzled with homemade chipotle cheese sauce and cilantro. Crispy on the outside, light and fluffy on the inside. Corn Cakes topped with sauteed Kale seasoned to perfection with a side of chicpea scrambler. Chic Peas, green olives, radishes, black bean lentil mix, sliced avocados, plantains, topped w/cilantro on a bead of greens. Smoked bacon Polenta hash on a bead of Arugula topped w/cherry tomatoes, avocados. Served w/red pepper chipotle sauce. 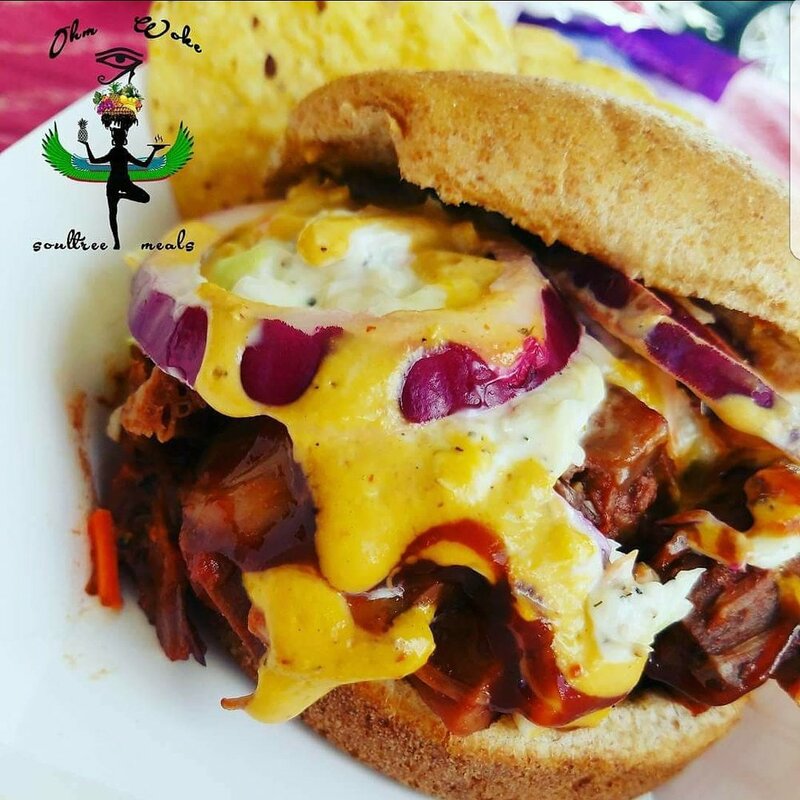 This mouth watering Pulled Jack Fruit Sandwich will have your palate reciting rhymes. Smoked Jackfruit, homemade vegan BBQ sauce, topped with garden fresh Red onions and our special sauce Slaw! Don't worry, we'll look away when you lick your fingers!